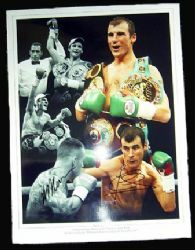 On the 24th October on a saturday afternoon, the annual boxing memorabilia fayre takes place! Organised by Chas Taylor who also runs the Lonsdale international sporting club, Chas hopes to have this year attending the fair, title prospects Billy Joe Saunders the former Olympian, and Ashley Sexton. Last year in attendance was former Commonwealth welterweight champion Slyvester Mittee, amongst members from the fight fraternity, the atmosphere was friendly and what with the adjacent bar, there's refreshments and snacks available. The venue itself is at St Aloysius hall, which is in Eversholt street in Euston, which is just a short walk from the station, it's about a ten minute walk and fairly easy to find, as it's on the corner of Eversholt street, next to the church, you will find the hall downstairs. A little advice I can give you is to before you go, to print out a map via one of the many websites and highlight your route, so you don't get lost! Start time is 1:30pm to 5:30pm, also if your coming by car then there's free parking available. For more details please phone the show's organisers Chas or Kym on 01707 654677 or alternatively 07956 912 741, but please as I can't stress this enough, phone at a respectable hour!